Close-up images reveal details of the agreement. Read the full joint statement released by President #Trump and Chairman Un. North Koreans learn of the historic meeting between KJU and #Trump for the first time on June 11th. "North Koreans have been left largely in the dark about momentous and potentially life-changing events..."
The signed agreement includes a commitment by DPRK for complete denuclearization. @realDonaldTrump, "this is complete denuclearization of North Korea, and it will be verified." The signed agreement includes a commitment "to recovering POW/MIA remains, including the immediate repatriation of those already identified. " Our fallen heroes are coming home. Hussein tried to call KJU prior to the #SingaporeSummit , and didn't have the updated number. 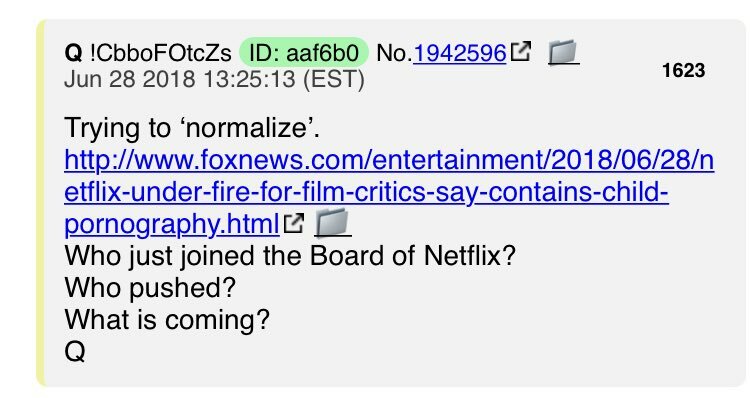 Communications with bad actors have been closed off. 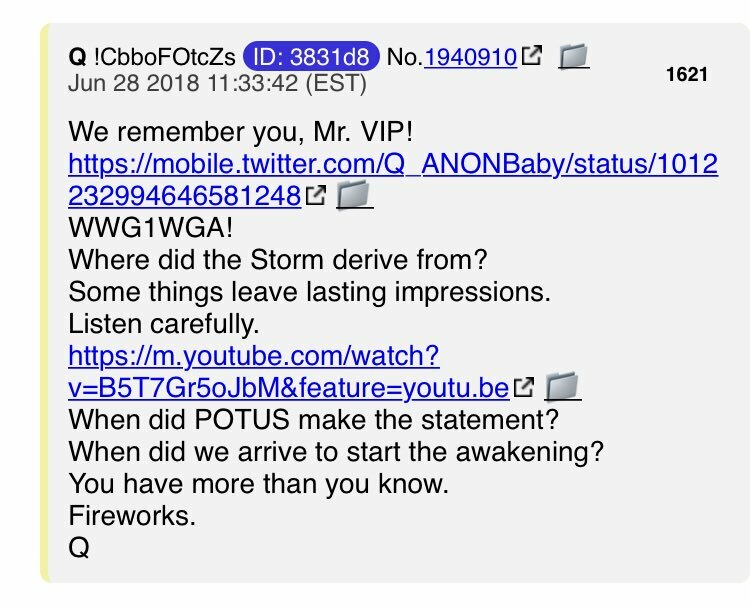 Q confirms that once blackhat generals in North Korea were gone, communication with the deep state was cut off. 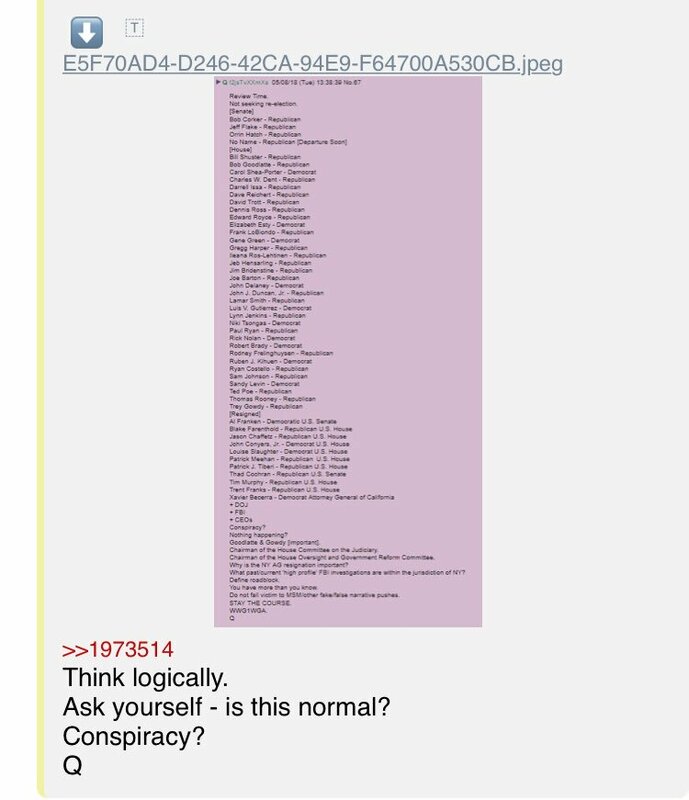 Google's Eric Schmidt, is the one who set up deep state communication tech with North Korea. 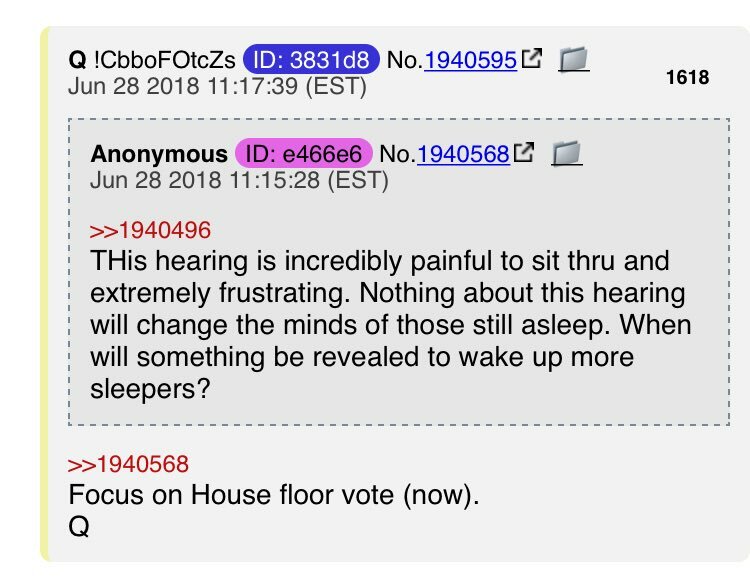 No sleep for ES because evidence kills. 4 points from the #SingaporeSummit document = 4 BOOMs. 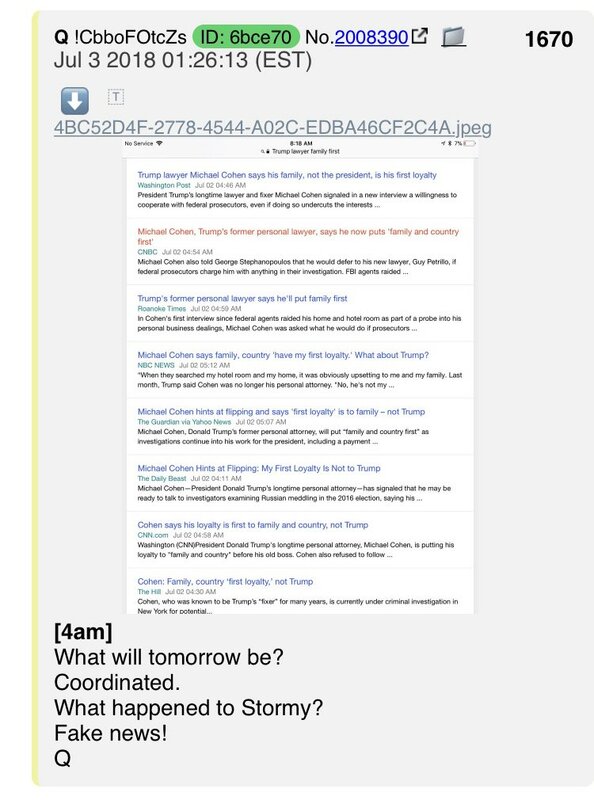 Anon asks Q if @realDonaldTrump tweets changing councel to counsel is code for Crowd Strike. 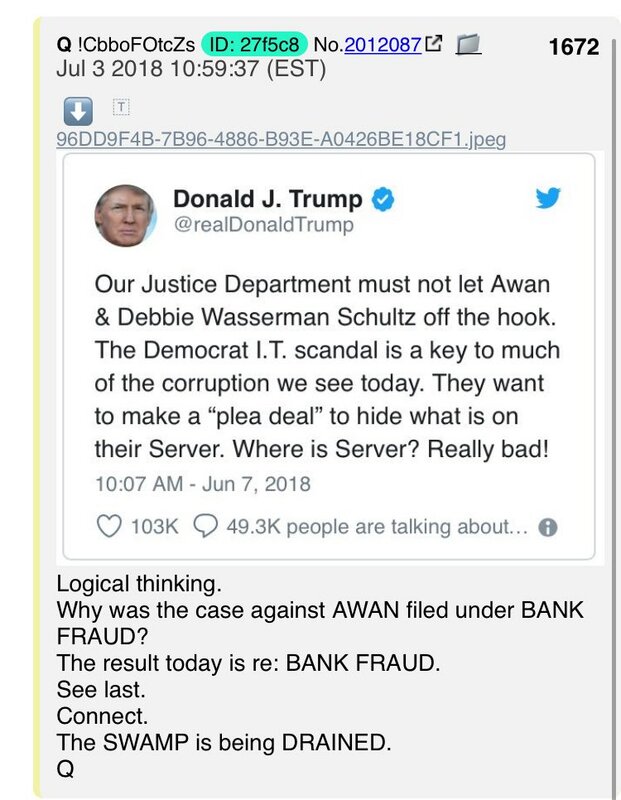 Q replies with #Trump tweet & 12/22 Q post. 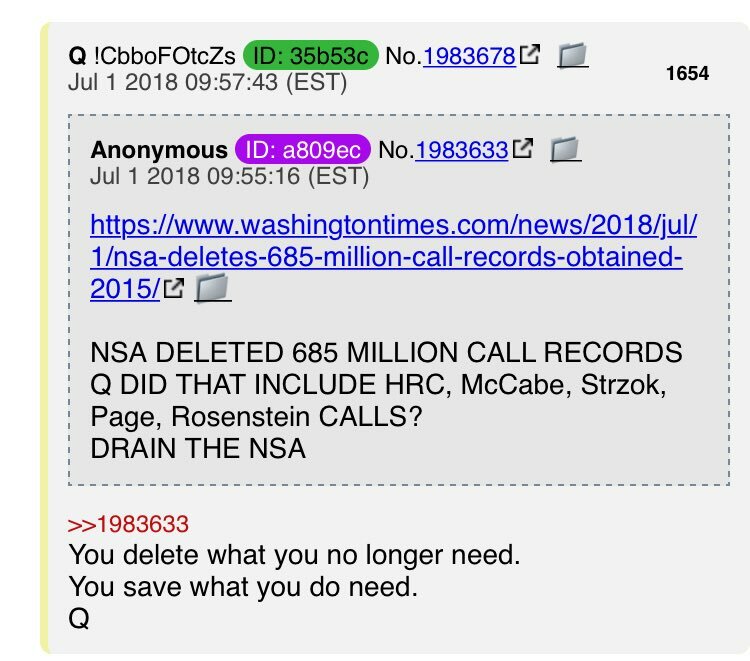 When the info is released, it will be the end of RR, Russia probe, Hussein Admin involved in illegal activities, bad actors in the FBI/DOJ, and all those who hate America. People are calling for the suspension of Acosta's press credentials after this embarrassing moment at the #SingaporeSummit. A clear attempt by Acosta to discredit or even derail the peace agreement. 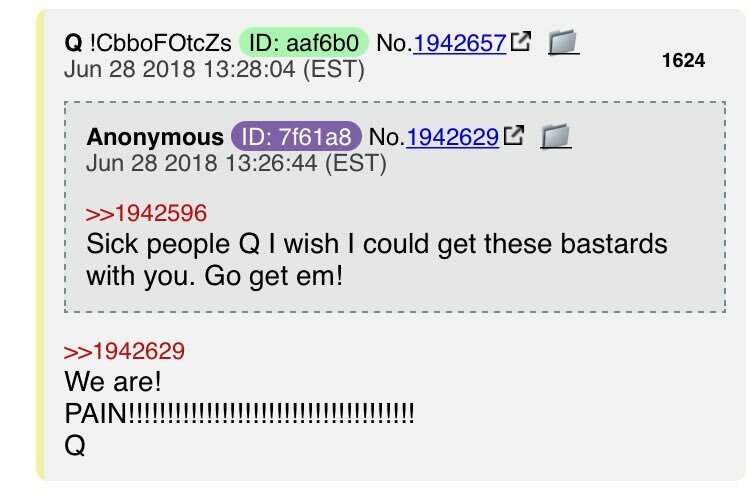 Guys, I think this is @POTUS talking to US --> Q+! God speed, Mr. President. Thank you! Certain events, like this missile launch from a Navy base near Skunk Bay, were not supposed to happen. This isn't a game. Ok folks, looks like we're under attack. 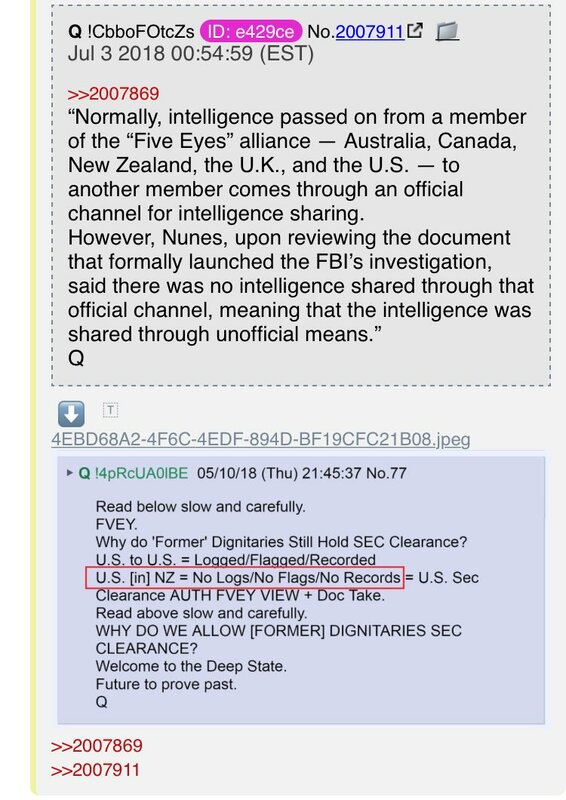 Q can't give classified info, but we have clues. Missing letters from #Trump tweets and the VOL pic will lead us to the answer. Ok, looks like good guys have hacked the bad guys, and they have eyes on the rouge sub that fired the missile near Whidbey island? A very likely scenario. NK sub stolen by deep state fires near Whidbey island. Target? 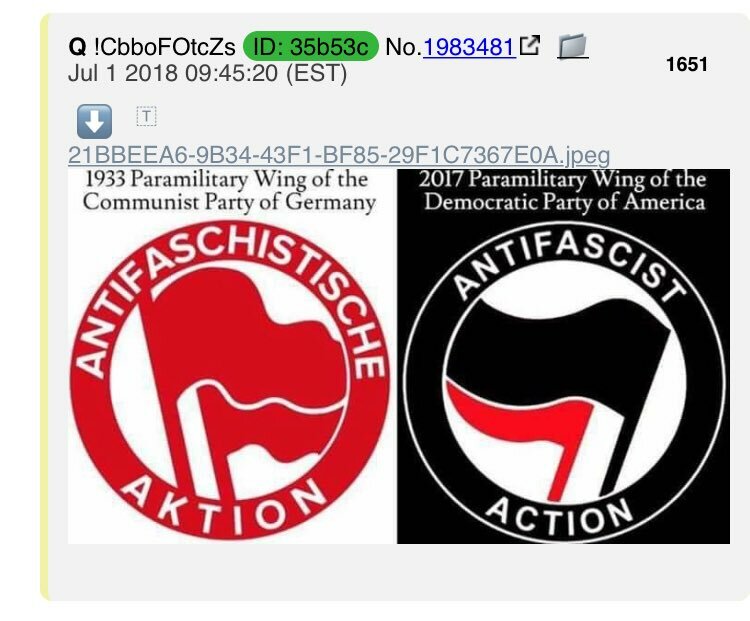 Have we confirmed where AF1 was at the time? The Canada pic is a clue. AF1 flew over Canada frm G7 to #Singaporesummit . Nice catch. Reverse image search of the sub pic pulled up some interesting info, and a closer look at the VOL pic shows an object in the sky. Missile? Drone? 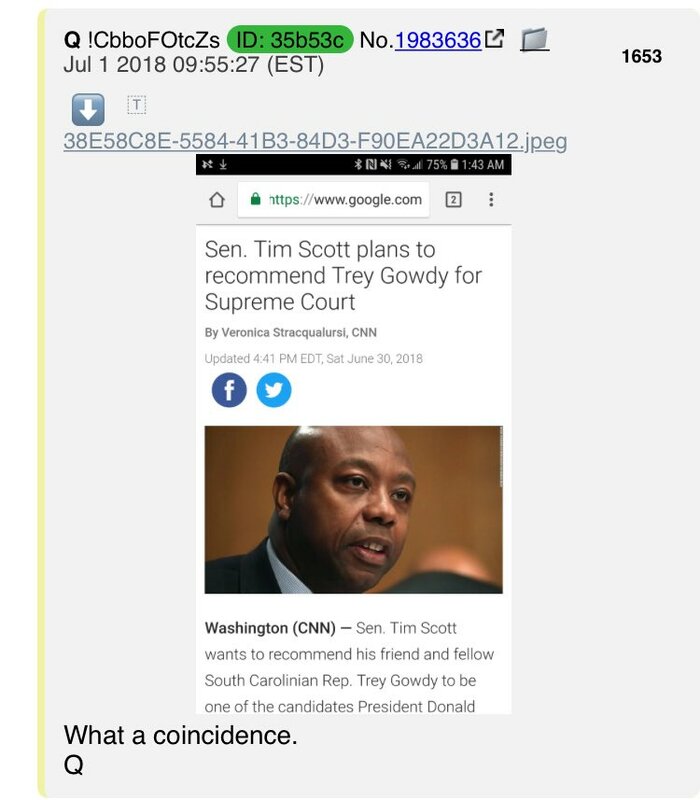 Here is the article with the same sub pic #QAnon posted. It states that Chinese hackers stole sensitive Navy data. 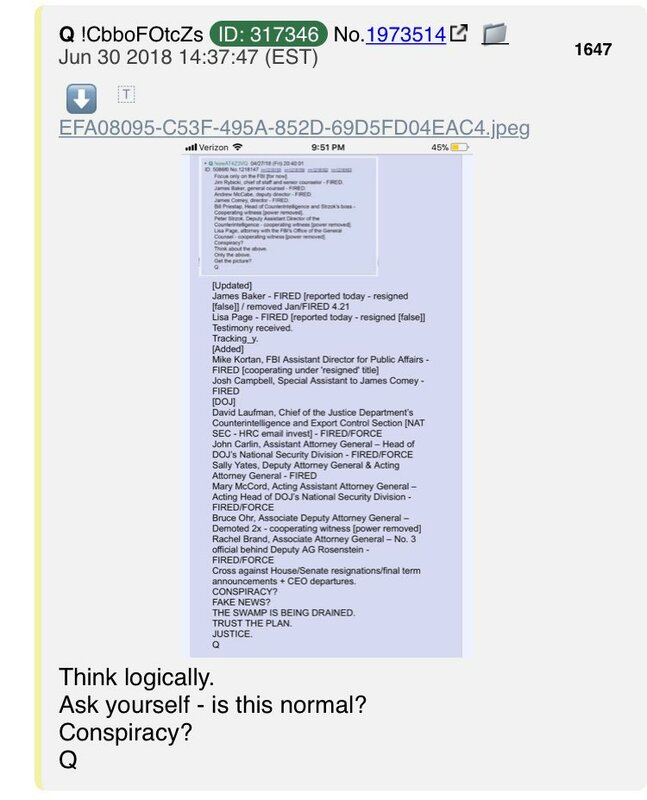 Anons think deep state forced a missile launch using Chinese hacked data! Here's a possible theory on the sub missile. It definitely makes sense. RR is accused of anonymous attacks of House Intel Committee staffer, Kash Patel, over his investigation into FBI/DOJ surveillance abuse. 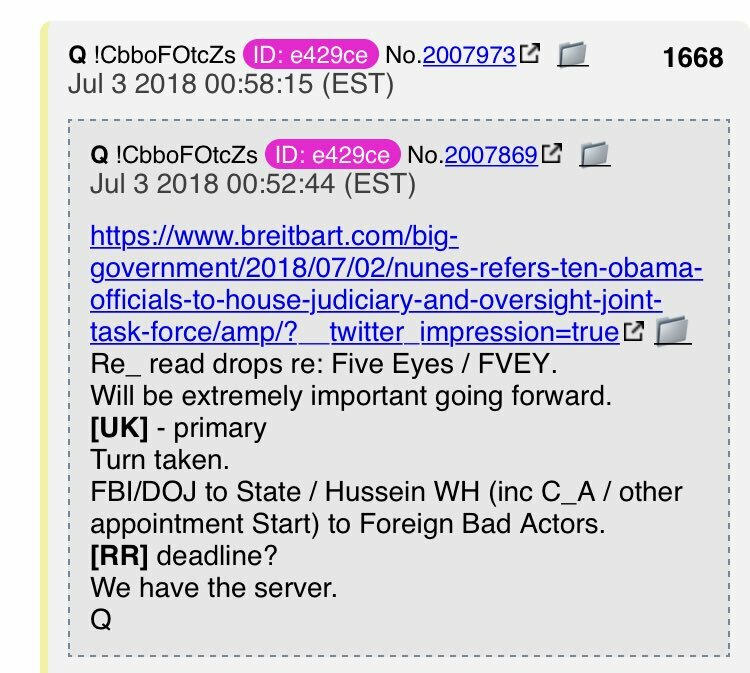 RR threatened to subpoena in order to stop the investigation. 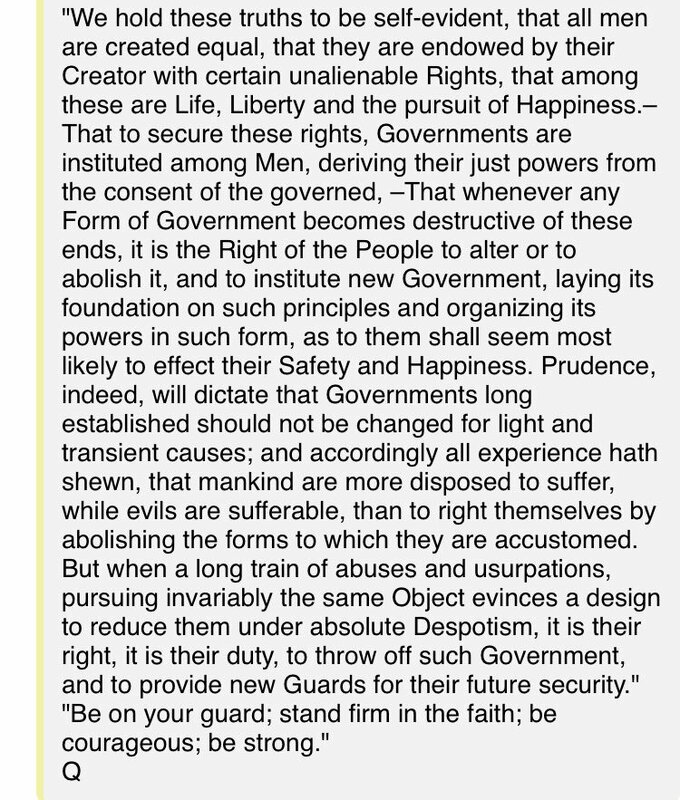 Good interview on Laura Ingraham re: RR. Here's part of Ingraham's Interview tonight with Freedom Caucus members, Jim Jordon and Mark Meadows. 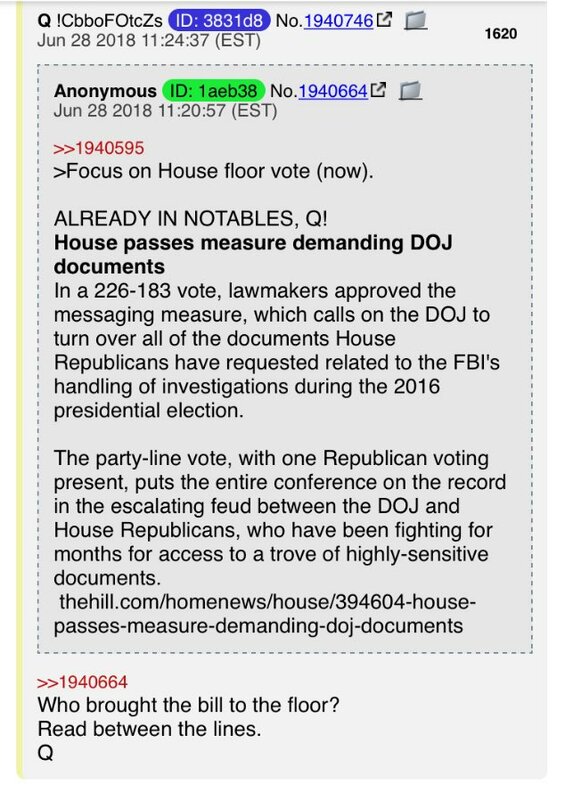 House members will put a resolution forward tomorrow to vote to subpoena DOJ (RR) to turn over docs. 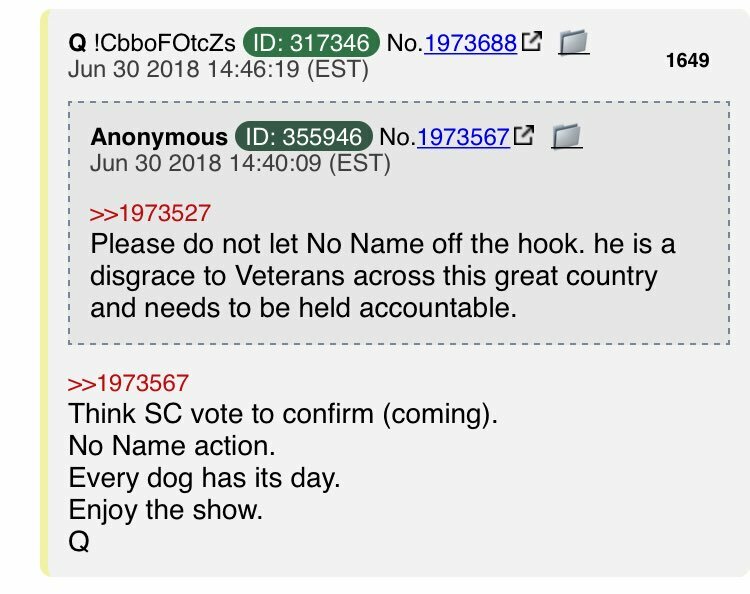 New #QAnon drops that were quickly deleted? Curious. Meant for the board operator? 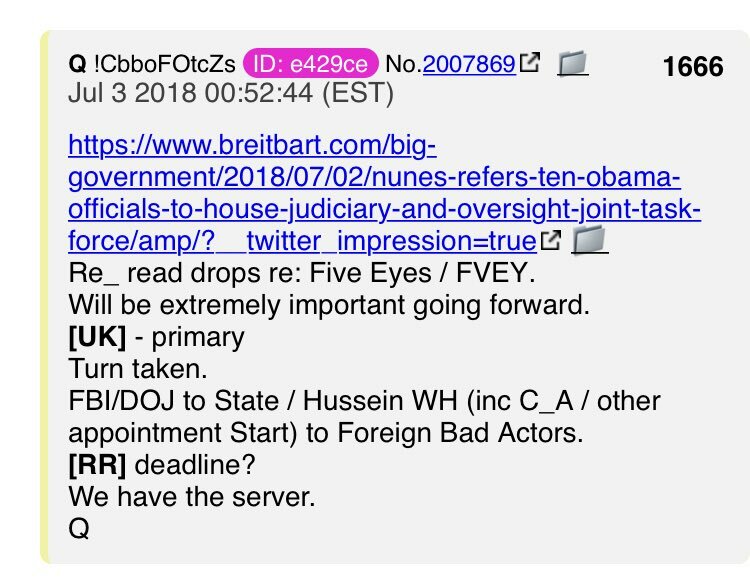 Deep State attack on #Qanon8chan board? 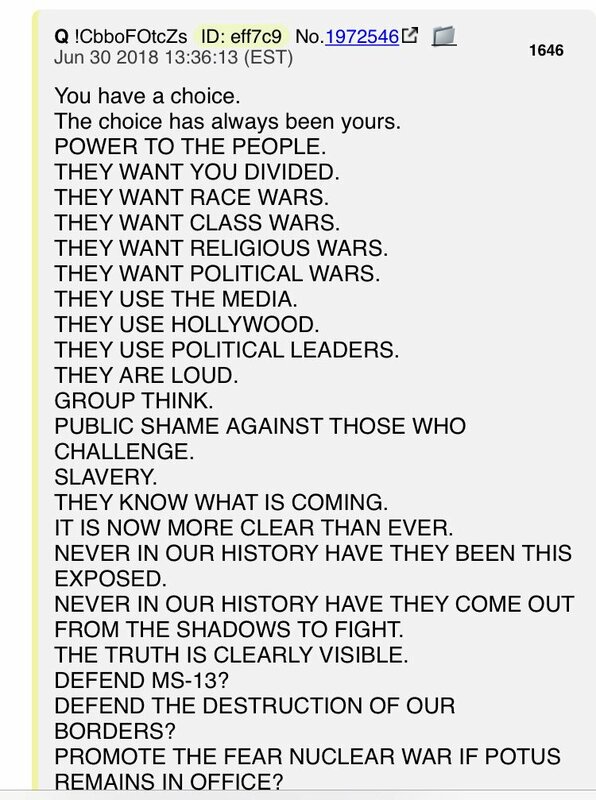 Anons are getting frustrated with weak, ineffectual promises to vote. 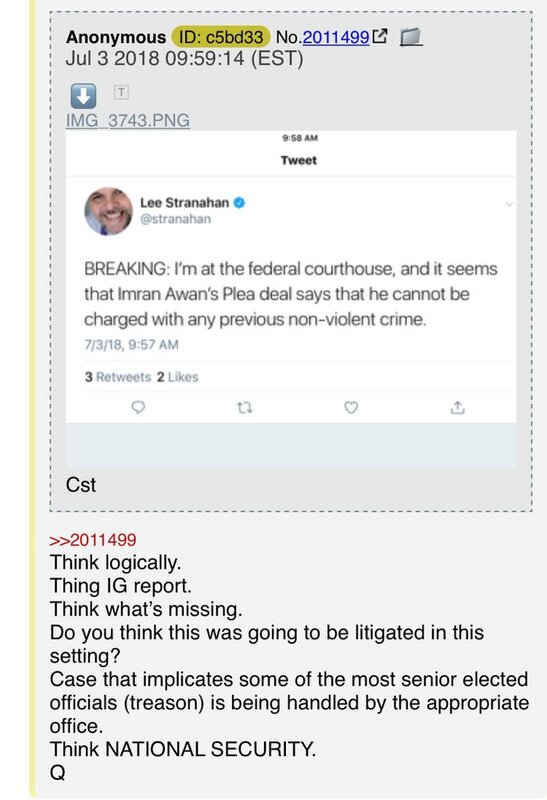 They want to see RR et al in cuffs. 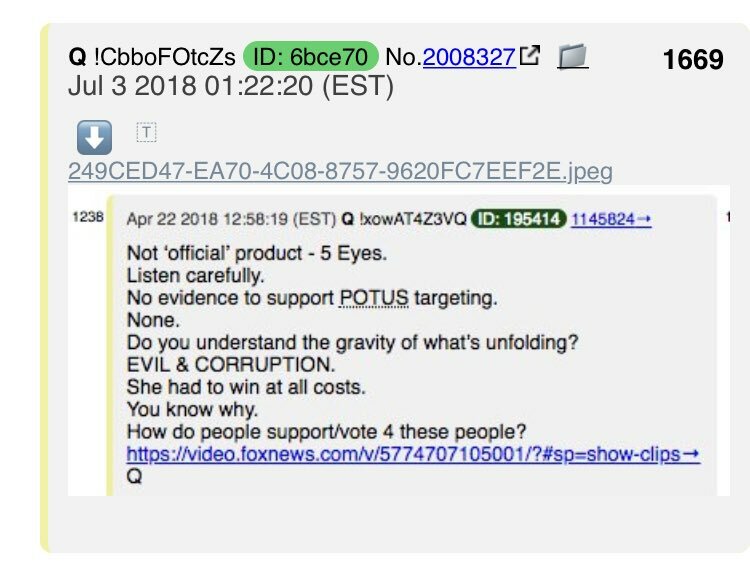 Q responds by asking Why are optics important? 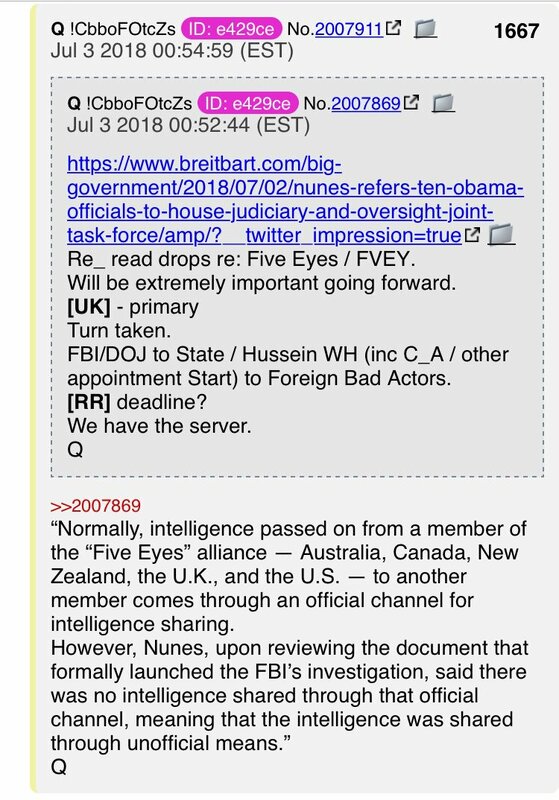 Q goes on to ask "AUTISTS ENGAGED?" Um, YES! DEFINITELY! Ryan brings the votes to the floor. Since he's not seeking reelection, he's not worried about optics. Others will have to distance themselves because they're seeking reelection. 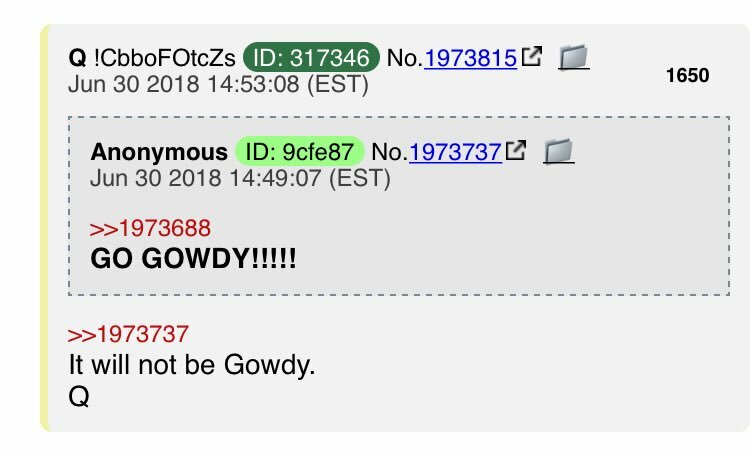 Q is advising anons to have a collection of Q proofs pinned on the #Qanon8chan board because very soon there will be an influx of new people to the board and proofs will be important. 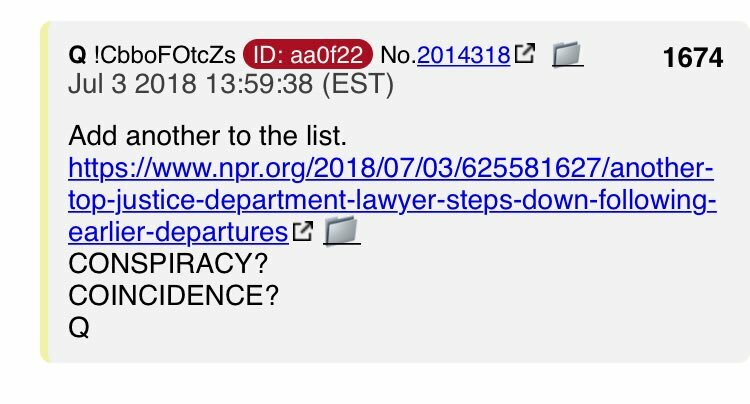 Q has agreed to confirm Q proofs that anons create, in order to give them even more validity, for public consumption. 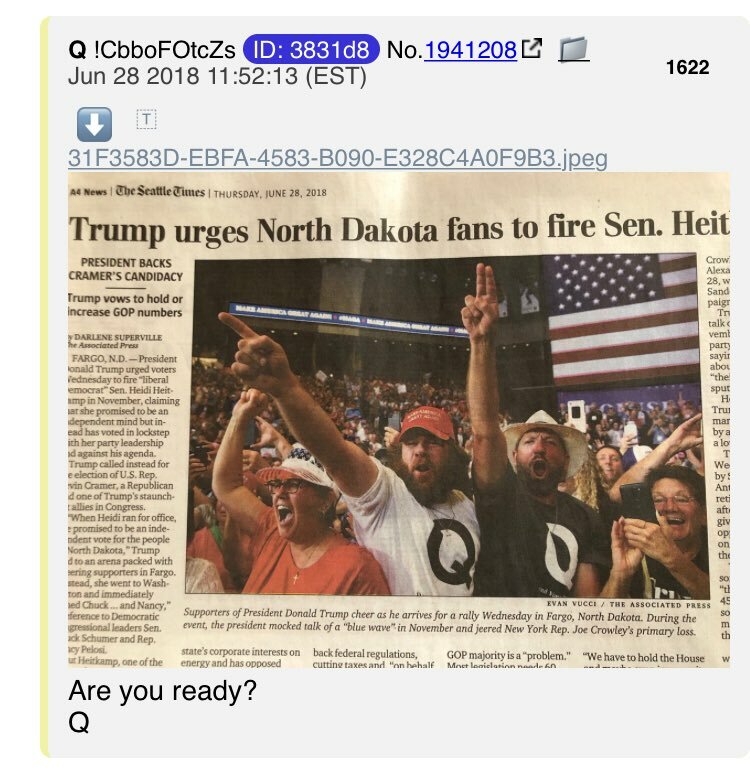 In the coming days/weeks, there will be millions of new people joining the #GreatAwakening . 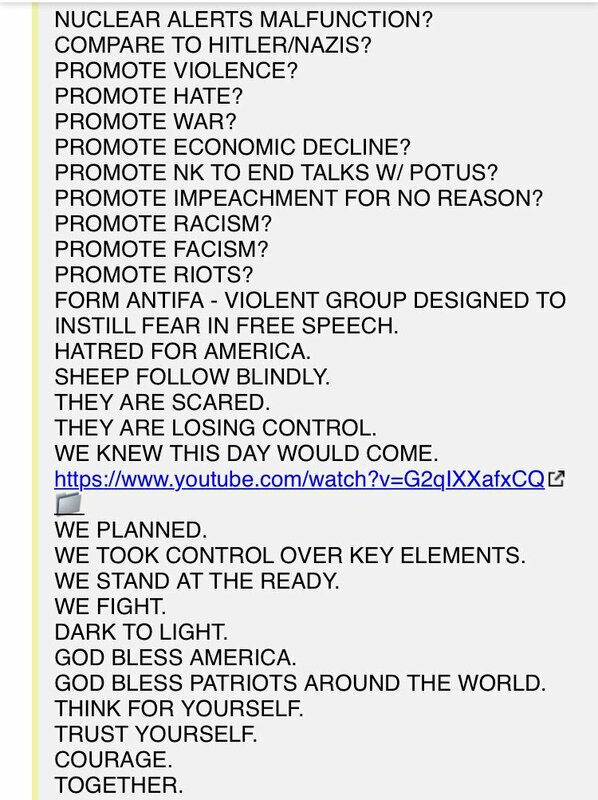 Here come more attacks from MSM, FB, Twit, DDOS attacks on 8chan, etc. 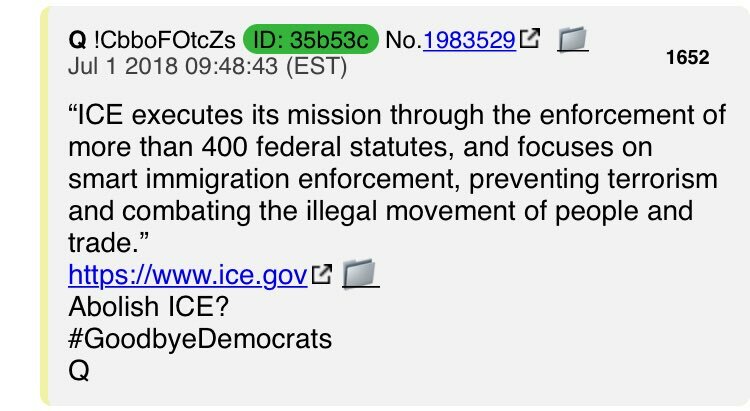 Here's the first of a barrage of attacks on the #QArmy. Thanks for the free publicity, Vice! @LisaMei62 gets a mention. Nice! It must mean she's over the target! And why @POTUS is here. 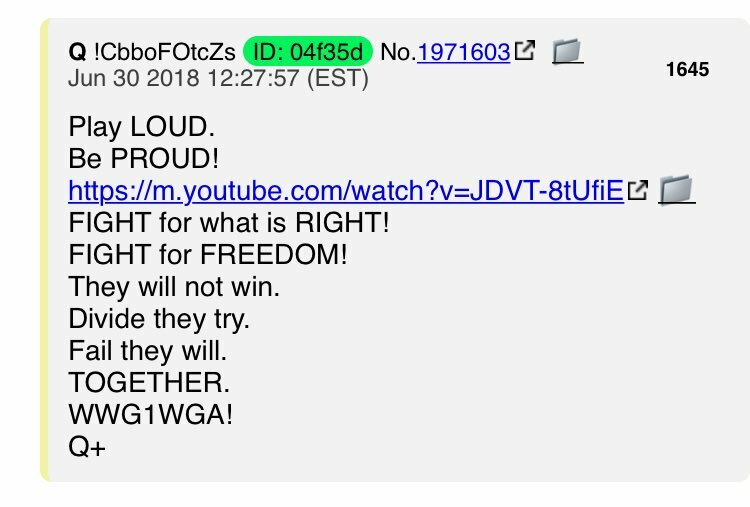 KEEP FIGHTING THE GOOD FIGHT, #QArmy! God bless! The grey wolf (Canis lupus; also known as timber wolf) shares a common ancestry w/the domestic dog.